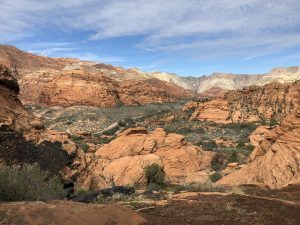 The day after we explored the Parowan Gap, we headed south to Snow Canyon State Park. We were looking for sun and warmer temperatures, and hoping for smaller crowds. I think we made a great choice. 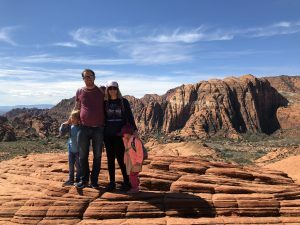 My family had not been to Snow Canyon before, and we decided the night before to visit this state park which left us slightly unprepared. We managed to have fun still, and that was a good lesson for me (the chronic over-preparer). The temperature climbed 10-15 degrees as we descended into St. George. We drove through the red rocks into the north entrance of the park. Pro tip: they don’t take credit cards at the gate, so bring cash if you have it! We stopped at the teeny visitor’s center to pay our fee, use the bathrooms, and to see if there were any stickers the kids liked enough to add to our collection. Then we drove back up to the Butterfly Trails. 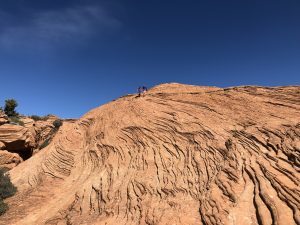 I’m not sure how long this hike technically is, as we really struggled to stay with the trail markers and ended up on a different trail altogether-the Petrified Dunes Trail. These dunes were fantastic. 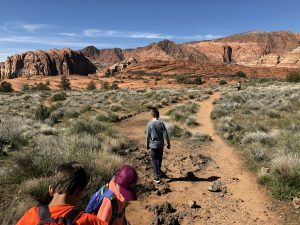 The kids loved exploring around, looking at the different vegetation (I just read that the annual rainfall in Snow Canyon is just 7.5 inches a year! ), and finding the unusual to us trail markers. We gained and lost a lot of elevation as we traveled to the end point of the dunes trail. This was the first hike where everyone carried their own lunch and we stopped to eat together. It was really nice to not be the designated carrier! 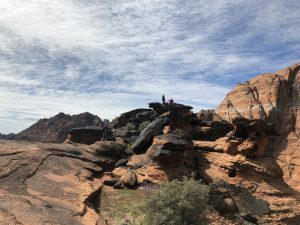 We chatted with a Friend of Snow Canyon volunteer who told us how the visitation numbers have exploded in recent years. They’ve expanded their trail system and are working on expanding the parking options, as the lots fill up by 11AM many days. After this hike we headed down to Jenny Canyon. 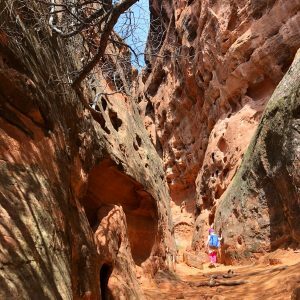 This tiny hike is a fun slot canyon, and it gave us a good taste of how fun sandstone can be. This hike only took 10-15 minutes, after which we headed across the street to the actual sand dunes. All of the sand was heaven for the kids. It had warmed up greatly by this point and the sky was mostly clear. We spent a couple hourshere, building sand castles and playing frisbee. It was near the end of this where I realized none of us had sunscreen on and that I hadn’t even thought to bring it! We won’t forget next time, especially with how burned my husband got. 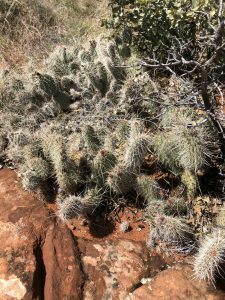 Next time we visit, I’d like to see the lava tubes and Johnson Canyon, as well as try to make it out to some petroglyphs the volunteer told us about. 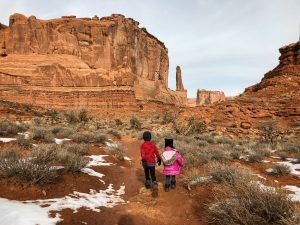 Snow Canyon is now one of my favorite places and I think my kids will remember the sand dunes if nothing else for a long time. In March, we had family in town with cousins similar in age to my kids. 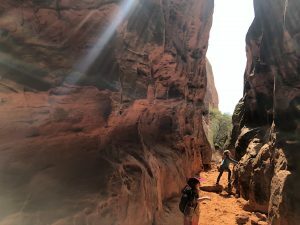 They love adventures too so we decided to meet down in southern Utah and have ourselves a good time. 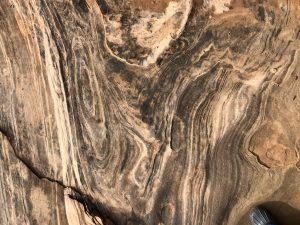 I have a couple of friends who have spent a lot of time down south near St. George, so I reached out to them for some ideas. Word of mouth helps so much. We got an AirBNB in Cedar City, to save a little bit of money and to be away from most crowds. I didn’t realize it was spring break for many students (my kids and their cousins are homeschooled so it’s not applicable over here) but I was so pleased with our lodging and our destination choices. Have you used AirBNB? It is my favorite way to travel. 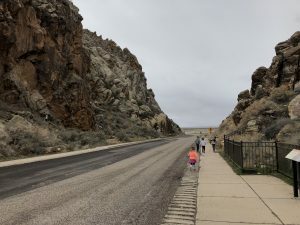 On the drive to Cedar City, we stopped in Parowan to see two big attractions: dinosaur tracks and petroglyphs. 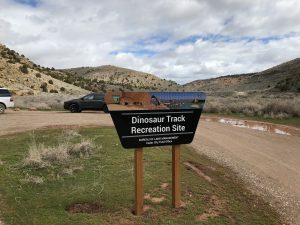 Just a few miles off the highway is a cliffside on BLM land that has several fossilized dinosaur tracks. Seeing dinosaur tracks in real life, and being able to compare our hands to their size, was just fascinating. 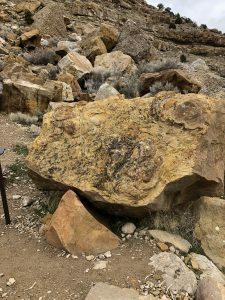 The kids climbed all around on the rocks and my husband who works with geologists pointed out many spots where fossils may be hiding underneath other layers of rock. 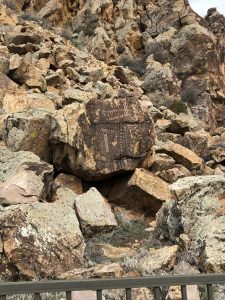 Next we headed down the road to the Parowan Gap petroglyphs. 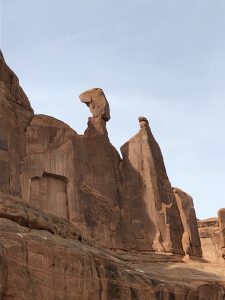 We had seen petroglyphs in Moab, on the Delicate Arch trail, a few years back, but this was just fascinating. We talked about how each culture and religion has it’s own creation story and ways of explaining things that happen. My kids didn’t quite grasp how new email and phones are (hi I clearly remember the sound of dial up and how I’d get yelled at when someone picked up the corded phone to call out and heard the internet sound), but we talked about how the petroglyphs were ways to communicate and to document experiences and thoughts. It was a good opportunity too to show my children how not everything is for us. We don’t really understand the glyphs but that’s okay, we don’t need to. The signs say the glyphs are from several different indigenous groups from around a 1,000 year time frame. We used this opportunity to talk more about Leave No Trace. This winter is lasting a long time! 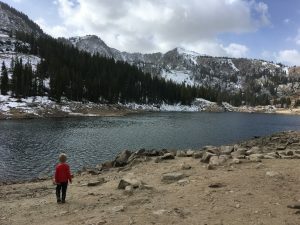 We’ve had quite a bit of avalanche danger the last few months, and because I have small kids and minimal avalanche preparedness training, we’ve been avoiding hiking in the mountains to keep safe. 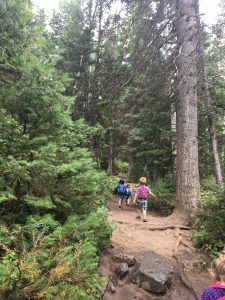 We homeschool and hiking is a pretty integral part of our weekly routine, so we’ve had to make adjustments. Here are some ideas if you’re going through similar frustrations. 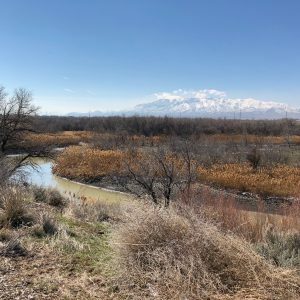 I have a list here of different valley trails we really like around Utah County. If you search my “accessible” tag, you’ll find some more paved trails. 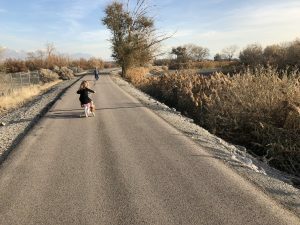 My kids have really enjoyed riding their bikes along the Utah Parkway Trail, which connects travels fairly close to Utah Lake. While the lake is really quite gross, it looks beautiful from a small distance. 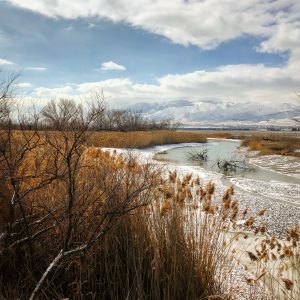 Other options are the Jordan River Parkway which has many different locations you can drop in from, and parts of the Provo River Trail. The Cedar Hills Parkway Trail is gorgeous as well. A year or so ago we bought IKEA’s watercolor palettes and cardstock paper. These non expensive products work quite well for my kids! We’ve been following YouTube tutorials by Let’s Make Art and my 7 and 4 year olds have been able to follow along. My 4 year old has a bit of a harder time but is definitely engaged and interested for the first 15-20 minutes. I started watercoloring last year with Michael’s Artist Loft brand of watercolors, brushes, and paper. Sarah Cray of Let’s Make Art has done a phenomenal job of making watercoloring accessible to many of us. Try it out! My son LOVES Art for Kids Hub, also on YouTube. The supplies list is small, too! Permanent markers, paper, and colored pencils are all you need. The host is so kind and encouraging and really great with kids. He’s a father who draws with his kids, and he gives kids a lot of confidence in their skills. My son has loved displaying his artwork in our living spaces and talking about drawing them. We play at our neighborhood park most days, even in the snow. It’s right outside our house, so we put on our snow clothes when we need to and head out. I walk around the perimeter for my own exercise and my kids get to play. As long as the wind isn’t strong and it’s at least 15 degrees, we’ve played at this park. Use Google Maps to find new parks near you and check them out. My kids like to build snowmen at parks. YouTube again, for the win! Cosmic Kids Yoga practices are so kid friendly. She’s engaging and expressive and fun. My daughter requests Cosmic Kids several times a week and she has dozens to choose from, with time frames of 15-45 minutes. It’s a great way to get exercise in as well as work on breathing, mindfulness, and strength. We have a couple of spots that we love sledding at. Well, my kids and husband enjoy sledding at. I’m not huge into sledding, so I prefer to snowshoe around while they play. Win win, right? 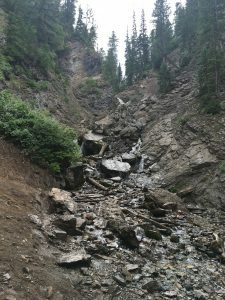 One spot is right off of Big Cottonwood Canyon Road, near the Jordan Pines campground. We also like sledding at the Stewart Falls trailhead. There are decent hills and sometimes there are no other people around. Today we went on a walk and saw leaf buds on trees, so spring is so close. What tips do you have for getting through the last bit of winter? We have a few years long tradition of doing a weekend trip for my husband’s birthday. January is a hard month and having something to look forward to after the holidays has been very good for my mental health. Two years ago I booked a cheap condo at Bear Lake, and it ended up being so cloudy we couldn’t see the turquoise! We also had to cut our trip short due to an incoming snowstorm. Last year we splurged on a, AirBNB right outside of Zion National Park. The location was ideal, the casita was super cute, and the park was empty. Empty! However, it also snowed and rained the weekend we were there, while the week before had been in the 60s. This year he requested Arches. 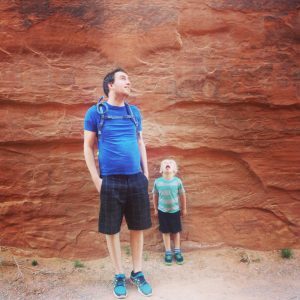 We found an AirBNB that was nicer than the pictures indicated, and 15-20 mins from Arches’ visitors center. 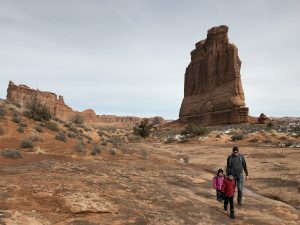 Moab is pretty empty in January as well and the park was pretty deserted. Part of this is due to the ridiculous government shut down, and part is due to the time of year. 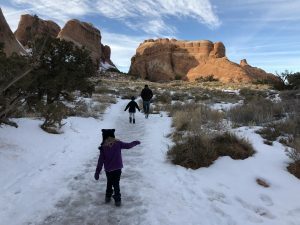 We’ve been to Arches a few times, but this was the first winter experience. We stopped in the visitor’s center first to get some souvenirs, donate money, and chat with a ranger about conditions. My husband was most looking forward to hiking Delicate Arch, but the ranger advised against it due to ice. I have YakTrax but no one else has spikes, and the last little bit of that trail is a bit sketchy. I’m pretty risk averse these days so we chose some flat trails to experience. 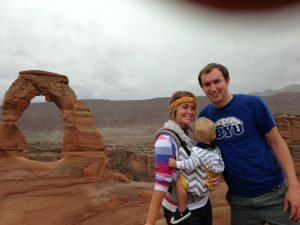 When our oldest was 18 months we hiked Delicate Arch with some family. I wasn’t into hiking at that point but have very fond memories of this one. My son was really fussy during the hike and so I waved the group on and sat on the side of the trail and nursed him. Then he fell asleep and I hiked with him strapped to my front the rest of the way. 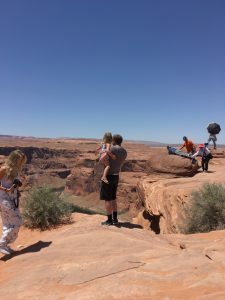 I got a lot of high fives and comments by people impressed by me, and I remember feeling proud of myself for figuring out how to make it to the arch with a baby. After the visitor’s center, we went straight to the Landscape Arch trailhead. This way we got to drive through the entire main road and see quite a bit. We parked at the Devil’s Garden trailhead and got our warm clothes on. It was around 35 degrees and there was snow and ice on the ground. Baselayers, fleece, hats, and gloves helped a lot (check my post if you need help figuring out winter clothing! Adults too.). 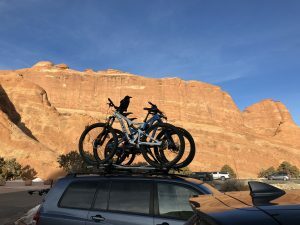 Two massive ravens were perched on the rooftop bikes next to us, getting ready for a good time. We hiked this trail three years ago when our kids were 3 and a few months shy of a year. I did put the sis on my back for a bit as the trail was super icy in spots. Because it is mostly flat I wasn’t concerned for our safety, and the kids genuinely enjoyed sliding around. 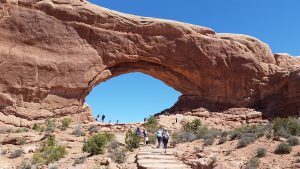 It took us about half an hour to reach the arch, and we enjoyed the sunshine and the views and the red rocks before heading back to the car. This hike is under 2 miles round trip. We called it a day here and picked up pizza on the way to the AirBNB. The next day we checked the weather and decided to leave that night instead of the following day as we had planned. 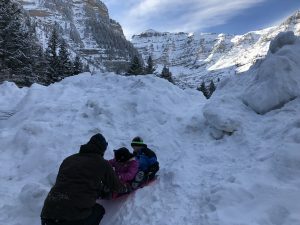 A big snowstorm was headed through our route home this year again, and while we have snow tires, we didn’t want to be caught in a canyon with high winds and heavy snow. 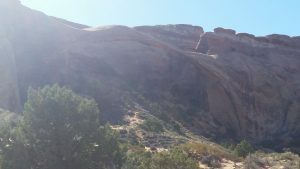 We reevaluated our ideas and decided to hike Park Avenue and then drive to the Delicate Arch viewpoint. 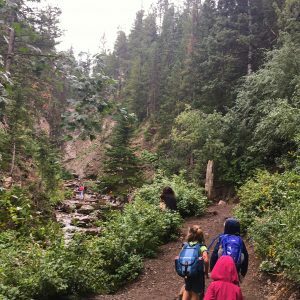 Park Avenue was so perfect for hiking with kids. Besides the descent into the canyon at the first of the trail, it is largely flat. While usually a pretty popular hike, we only saw two other humans. 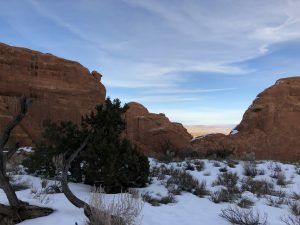 We walked along tall sandstone walls, admiring the way erosion has carved shapes from the canyon’s edges as well as the rock under our feet, and seeing which small sandstone bowls were covered with ice. 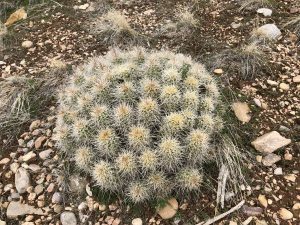 We had many opportunities to discuss staying on the trail, leaving no trace, and being so careful of the biological soil crusts. This hike is about 2 miles round trip and pretty easy. Next we drove to the Delicate Arch viewpoints and had lunch in the car. After eating we hiked up to the upper viewpoint for a better look at the arch. We did see several people around the arch but felt confident in our decision to not go without spikes. 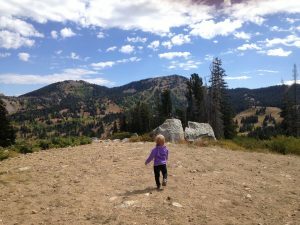 This hike is short and somewhat steep, but our three year old had no problem. We took some pictures and then headed out of the park. 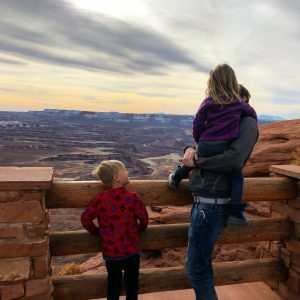 My favorite NP is Canyonlands, and my husband took us there as a last stop before heading home. Something about the salt edged lower canyons next to the river, the series of cliffs down to the valley floor fascinate me. I love it. We stopped at the Green River overlook for a few minutes and then called it a trip. Hopefully we can head back in less icy months to hike Delicate Arch. 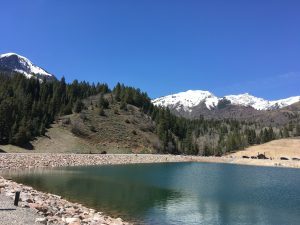 Twin Lakes is one trail option that branches off from Silver Lake, the accessible one up at Brighton Ski Resort. Twin Lakes climbs above Silver Lake on a decently steep slope, presenting you with beautiful views first of the lake and then the surrounding valley. It is a fairly exposed hike, but the lake is really quite pretty. 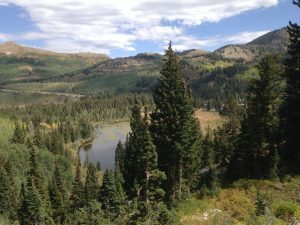 This hike starts at the back of Silver Lake. 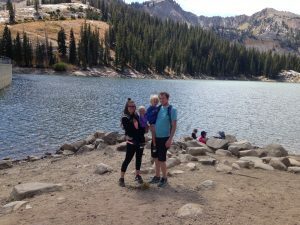 My post here covers Silver Lake pretty thoroughly. We’ve seen moose here on the boardwalk a few times, and the kids love to watch the fish in the water. At the backside of the lake, once you’ve hit dirt trail, there is a branch off for Twin Lakes and Lake Solitude. Twin Lakes heads to the left and Lake Solitude continues straight. Take the left branch, up the side of the mountain that borders Silver Lake. 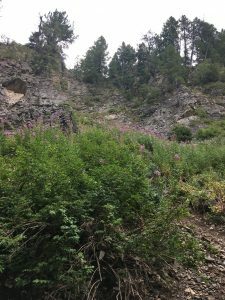 This portion of the hike is quite exposed and the slope can be steep at times. If it’s near freezing, consider spikes and hiking sticks for your safety. 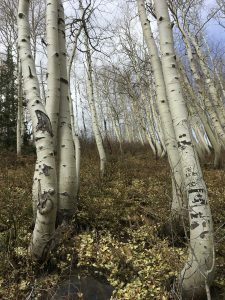 You’ll hike through small boulder fields and evergreens, and get to see signs of ski season. Of course, the view is enhanced with the elevation gain, as the valley and mountains around Brighton are picturesque. Twin Lakes is a reservoir, so toward the end you’ll see signs of that, like metal railings around the edge of it. At the lake, we like to explore a bit and have our snacks. The pines and firs around it bring a heavenly scent to the area. 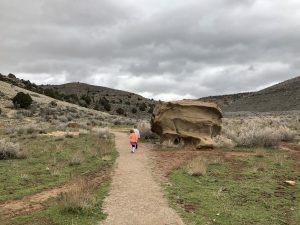 This hike is one of the harder ones my kids have done. We’ve had a decent amount of whining with the combination of exposure and elevation gain. 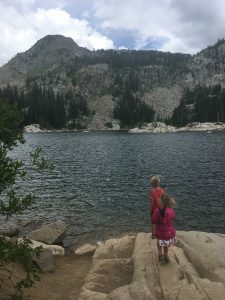 They love throwing rocks in the lake at the top, and you deserve a good break there after the climb (especially when you have to carry the snacks, water, and the child!). Use your distraction toolbox (friends, snacks, songs, games) and point out the different plants, animals, and bugs you see. If you can take friends along, do that! It’s been so hot in the valley that hiking is difficult. I know summer (especially high summer) is temporary, but avoiding sunburns and heat exhaustion is priority right now, while still enjoying the varying landscape. 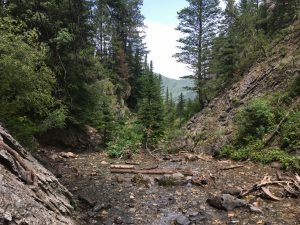 This week we went up to Donut Falls in Big Cottonwood Canyon. Due to morning swim lessons, we went in the afternoon, but thanks to afternoon thunderstorms the temperature was excellent. We got to the trailhead around 12:30pm. 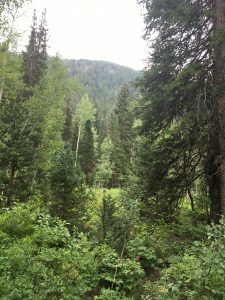 This hike is easy and short with lots and lots of tree coverage. My 3.5 year old didn’t complain once, which was great because I ended up piggy backing my 6.5 year old after his shoe broke. This hike gets packed especially on weekends, so be prepared. Where: Big Cottonwood Canyon, SLC. About halfway up. Busyness: BUSY. So so so busy. Big Cottonwood Canyon is one of our favorite canyons. We go year round for hiking and for sledding and snow shoeing. This trail starts right before the Jordan Pines campground. There is a gate on the south side of the road that closes during winter. When it’s closed, your hike will start there. When the gate is open, drive through and park at the trailhead or anywhere close that parking is allowed. There are a couple of hills at the beginning of the hike, but otherwise it is fairly flat. We worked on our flower identification and saw cow parsnip, monkshood, bluebells, asters, and twin berries. On the way to the waterfall, some red peaked out of the green bushes and we found wild raspberries! At the end of the hike, you have to climb down some rocks (maybe 15 ft worth) to get to the river. We all sat on our butts as the rocks were wet from rain, and no one got hurt. Be careful here with littles. 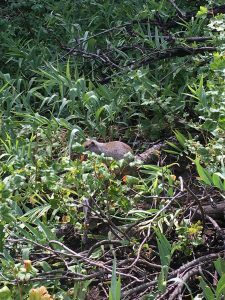 Then you walk along the riverbank until the trail ends. Cross the river (this time of year it was shallow and quite cold) to the opposite side, where a white placard is posted. We let the kids snack and play in the water here and didn’t climb further. Alpine squirrels and chipmunks are all over this trail and they get super close to hikers. We didn’t feed them, but they tried to get into our packs when we set them down at the river. They can chew threw fabric so be aware! I’m not comfortable taking my kids to the top, especially since I have fallen in a waterfall before, but tons of people do. The pictures look really neat. This is a great little hike when you can start at the trailhead. Shaded, lots of foliage to point out (go in July if you want to see more flowers! ), and waterplay. We made it there and back in about 2 hours, including a lot of time playing at the destination. So. I have a three year old. Have you met three year olds? They’re called threenagers for a reason. My daughter has a strong personality and deeply held opinions, like wearing dresses and jelly sandals every day. Even when we hike. Maybe especially when we hike, because she can tell it bugs me. This is a battle I’ve chosen not to fight. In fact, I made her wear her hiking shoes this week, and she got blisters. She’s been fine hiking in her jellies up until now, so the joke is on me. She also loves her ratty “beautiful princess dresses”. I’m letting it go, because she hikes just fine in them. They get dirty which she doesn’t like, but that’s a natural consequence I suppose. She’s hiked herself to waterfalls, overlooks, and lakes in her jellies and dresses. And that’s what we’re working toward anyway, to have her strong and happy enough to hike herself and not go uppies. To spend time together in the wild. All this to say, it’s okay to choose your battles when hiking too. 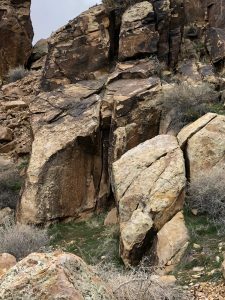 For many reasons we don’t do intricate or technical hikes, and this allows a lot more freedom in choice for each of us. 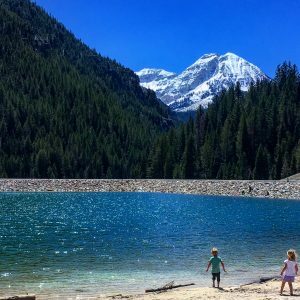 They’re learning to love the outdoors and the mountains together, and that is my ultimate goal. As I’ve mentioned, I’m still a new hiker. I started just a few years ago with no childhood experience and am learning a lot every time. Sometimes it’s simple like “bring more snacks!” and sometimes it’s bigger. 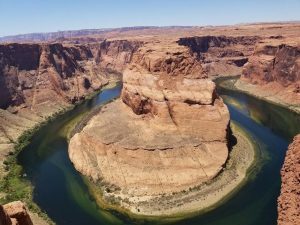 Last week we went to Horseshoe Bend. It wasn’t geat for my anxiety-no rails and sheer cliffs with massive drops down to the river freak me out. 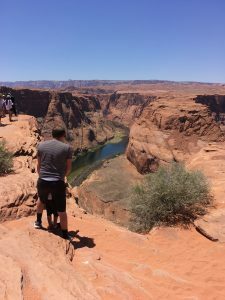 My husband is a good sport and helped the kids experience the views while I focused on breathing. The “what ifs” flood my brain in situations like that. 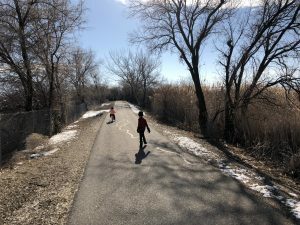 A couple weeks ago, I was the only adult at our neighborhood park when a kindergartner fell off his scooter and sliced a big chunk off his chin. Blood was everywhere, he was panicking, and the other kids were in shock at the sight. Thankfully after some pediatric plastic surgery, he was fine, but I’ve been thinking about that since. 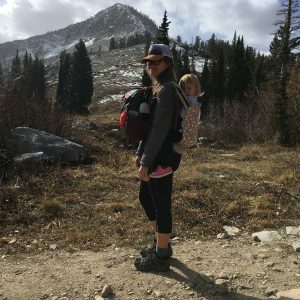 What if a similar accident happened while the kids and I were hiking? We could trip over rocks or felled trees so easily. I don’t habitually hike with any first aid kid, though we have two in our car, and my first aid training is super out of date. The anxious part of my brain tries to convince me that staying inside, avoiding adventures and risk, will keep us all safe. Logically, I know that’s not entirely true and that if I listened to my anxiety, it would be at a big risk to the rest of our brains. That said, I’m more determined to keep my first aid kit on me while we are hiking, and to take a refresher first aid class and/or get a wilderness specific first aid book. Hopefully with some planning, we avoid anything catastrophic. If you have any course recommendations, let me know. 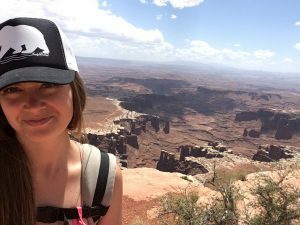 REI offers some (pricey) classes sponsored by NOLS, the Red Cross also has some, as does Wilderness Medicine of Utah,and I’ve seen some books that may be interesting. If I find more info, I’ll update this post. One of my favorite parts about Utah is the landscape diversity. We love the mountains around us, and those mountains bring lots of lakes, rivers, and streams. Sundays are often slower days (but not always, and not recently), and we love to get out as a family then. 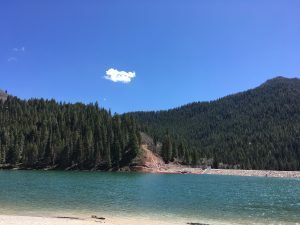 This last weekend we headed up to Tibble Fork Reservoir in American Fork Canyon. Within the last couple of years, a new dock and a decent sized sandy beach were added to the dam. The water is always cold due to snow run off, but it’s a beautiful destination. Bring wind breakers and sunscreen! 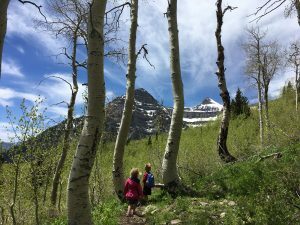 We also checked out the Tibble Fork Loop trail, but turned back probably a mile into the hike. The trail was extremely narrow and tilted toward the water, and my kids don’t know how to swim yet. It was still a lovely jaunt through the forest. Special note-you do need a National Parks Pass or to pay for a 3 or 7 day pass to get in. Bring sand toys and check it out! It’s halfway through April and we woke up to three inches of snow. This past winter has been all over the place, and while I’m trying to embrace what is, I just can’t wait for warmer weather. 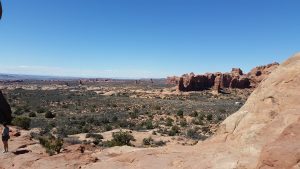 Two years ago this month we took a quick day trip to Arches National Park. At the time we had a four and one year old, a somewhat unreliable car, and didn’t want to mess with bedtime out of our home. Day trip it was! We scoured some pages on nps.gov and maps to see what we could fit in with just a few hours in the park. Our oldest had a limit of 2-3 miles at the time, but we wanted the 7 total hours in the car to be worth it. We left early in the morning with lunch and snacks packed, lots of water, and sunscreen. 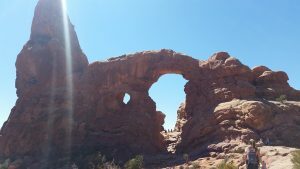 Our first stop once we were in the park was Double Arch and The Windows Section. 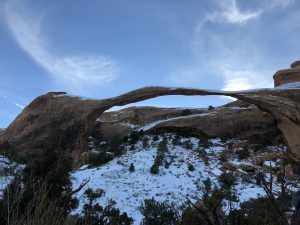 The total was around a mile and a half round trip to two beautiful, tall arches that touch on one end, and then up close to a couple window-like arches. It took us an hour or so, including hiking and gazing in awe. Next we had lunch and then drove through the park while the 4 year old rested. The baby fell asleep, so we parked at the trailhead for the Sand Dune Arch. She and I waited in the car while my husband and oldest did this 20 minute, third of a mile hike together. 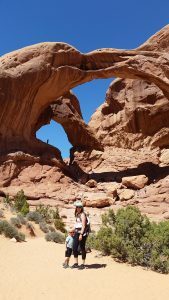 Our last stop was our biggest, an hour long hike to Landscape Arch. This was the toughest as my oldest had already hiked a couple miles and was hot and tired. We went slowly, letting him play in the soft sand and pause in the rare shade. This hike is around 1.5 miles round trip and we drank plenty of water during this one. After our last hike, we hit up a Mexican restaurant in Moab and headed home. It was a lot of driving, but a great trip for our family at the time. Two years later my son still remembers the arches and wants to go back. Hopefully we can revisit this year and explore even more. Bring water! We have a few hydration backpacks (Camelbak, Osprey) and water bottles (love my Hydroflask for hiking). Snacks and lunch, sunscreen, hats and sunglasses are pretty necessary in the desert. Good shoes too, as hiking in sand can be more demanding than harder surfaces. At the time my one year old was in an Ergo Ventus which worked great for her size. Hi! 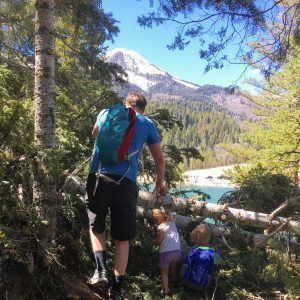 I love hiking and getting outside in Utah with my kids. 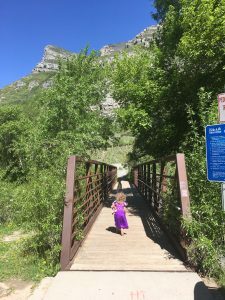 It can be daunting, but I’m sharing tips for smooth hikes, and places to go. Join me! And please contact me if you’d like to share your own experience.